Well, as many people predicted, today's stock market was a wild and volatile ride. 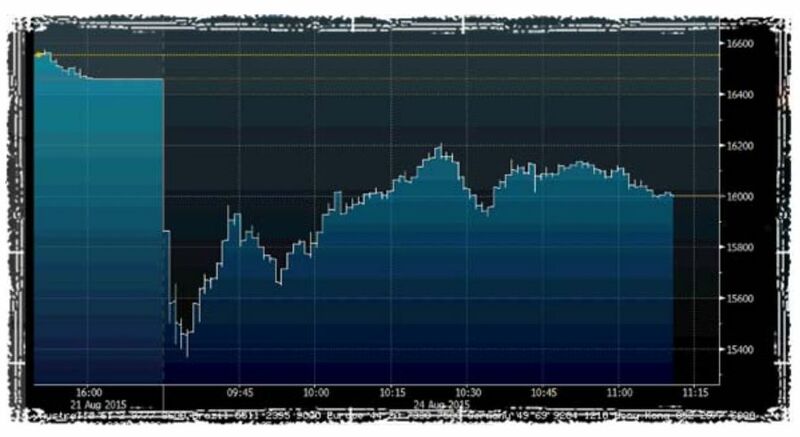 Stocks dropped over 1000 points moments after opening, then went wild all day, finally closing down around 560 or so points. These events have generated endless online chatter, as you can imagine. A lot of people are suddenly becoming more interested in preparedness, thinking, "So much to do and so little time!" There's a sense of urgency in the air. I don't believe today necessarily ushered in the start of the next great depression (history will tell), but it certainly illustrates the kind of mad, rapid changes that can occur between one week and the next. Which begs the question -- are you doing anything differently in light of the last few days' worth of volatility on Wall Street? Are you adopting a "wait and see" attitude or a "let's hurry up?" position? (Husband of the boss addendum: I actually do think this is a sign of the coming depression. One of many signs. This "hiccup" had a cause and it wasn't just bad news from China. The equities market has become nearly severed from the real world due to fiat cash infusions, swaps that raise stock prices artificially, and the ever-bewildering and pretty much unregulated derivatives market. Today wasn't the first sign. It won't be the last. But this I tell you true -- it's all coming down. Soon. No election will change it. No injection of additional monopoly money will stop it. Prepare. Please. I have to admit that I agree with Don. I think this was the first hint of what is going to be coming. I guess I have been a prepper most of my life of one kind or another. My present problem is my age and all that I have going wrong health wise. I just find myself unable to do many of the things that I used to take for granted. The saving grace may be that my son can come to the homestead if things get really bad. That and the wife who should have been a pioneer woman. She was having real problems with her Knees but after they were replaced she is now gardening again. I take care of the chickens and she does most of the rest. I have been reading about the fires in northern Idaho, are any coming near you and the rest of the area? As i watch and listen I have heard only one person taking it more seriously and that is beyond disconcerting. My gut feeling is that we will soon be in some combination of "The Road" and "Revolution" . . . So many will perish needlessly because of their refusal to prepare at all . . It did make me realize it was time to rotate and fill in my stock, something I have put off for the summer. But all in all, don't really need much more. There is only 2 of us, 3 great Danes and 2 cats. Maybe more pet food! The Dane puppy is 175lbs. and does he ever eat!!! It is 10 am Tuesday. 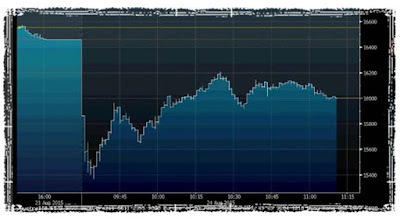 Headlines read: "TURNAROUND TUESDAY: STOCKS REBOUND". Halleluiah! Americans will breathe a sigh of relief. Life is good. Hey, who won the game last night? What nation should we bomb next? Wow, little Johnny chose to use the girl's bathroom at school. That reminds me, what time does the abortion clinic open? My point is this. Once-great America has devolved into a wicked nation. Perhaps God has already passed judgment on it, or at least on the masses. While I am not in panic mode, I do believe and have believed for quite a while, that we are approaching the tipping points of many influences on us and the world as a whole. I have been planning a major shopping trip for groceries and basic supplies since about June. Unfortunately I have put it off because I having been finding a myriad of homestead projects to do. Come heck or high water, the beginning of September I am going to make that trip to the big store. Projects will simply have to wait. I do think Don is correct, the question is the pace of acceleration AND what the current administration will do to screw us over along the way. I work with the poorest of the poor in my area. Even those who live in the woods receive food.stamps a check, and free medical care. Others receive reduced rent for housing. The ones in the woods decline housing. Most have cell phones, tablets and cable tv. Last week our agency laid off 27 staff members, all people with degrees, and several theraputic programs were cut. Our agency is 3.5 million $$ over budget. Factors include insurance companies no longer covering many meds and services, rents and utilities going up and up. This week in my Living Skills class I will once again encourage my mentally ill clients to stock up on shelf stable food and water..and we will imagine life without my agency providing meds or transportation. Just sayin'. From what I've seen here renters are monitored and stocking up on groceries is considered hoarding and, therefore, not allowed by officials. We have a group with a tent village near my house who eat at the soup kitchens. I wish I could say they have amazing survival skills, but that's just not so. Rather than living off the land they are "harmless beggars" . ..
Three years ago the food bank, most frequented by our clients was open 2 days a week. It's now only open 2x month. Others have closed completely.. Too many people in line, and food donations are way down because the middle class (27 laid off last week!) is struggling and has less to give. Agree with you What if....Our poorest of the poor (obviously rich and spoiled compared to the real poverty in many,other countries) are incredibly dependent. They are bewildered and angry when insurance will no longer cover their rx med for allergies. The whole system is broken and a reset is coming down the pike. Going to go through the goods this weekend and see what we can get/ do in the next few weeks. We are losing our stock up space due to family moving in with us. Getting cash out of the banks is on our list as well. Haven't had much time to think about the news this week due to school starting.